This my first tattoo. The Symbol is called a Vegvisir. The meaning is sort of a compass. To the Vikings it was a direction sign meaning "see the way". Since i'm of German/Scandinavian decent it has great meaning to me. Its on my left peck and took about 5 hours On Phil Garcia's table. Picture was taken right after we finished. 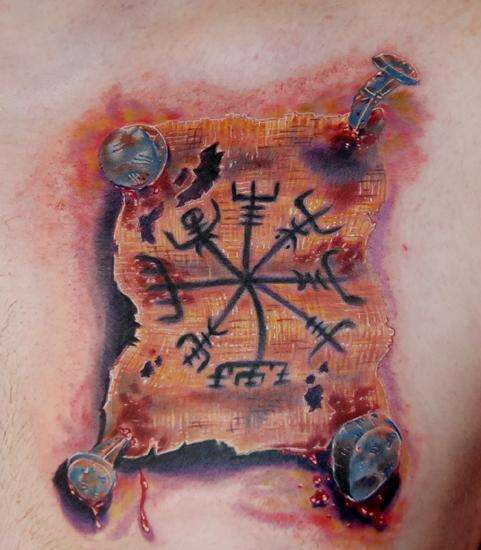 I am planning on getting Vegvisir. I am of Viking descent too. I really like your design.